Enjoy your garden more. Build practical outdoor tool storage units, a potting bench and planters with these easy to follow step-by-step instructions, plans and photographs. You don’t need any special woodworking skills to build a handy gardener’s bench in a weekend. You do need these downloadable plans and instructions. Build this simple storage cabinet right in your garden. It's an attractive feature and keeps small garden tools dry and close at hand. This outdoor shed/closet is small, but compact. It'll hold most of your gardening and lawn care tools and supplies and keep them close at hand. Assemble an easy-to-build storage locker for your outdoor tools. It's low and compact, yet spacious enough hold your lawnmower, long-handled tools and all your gardening materials. 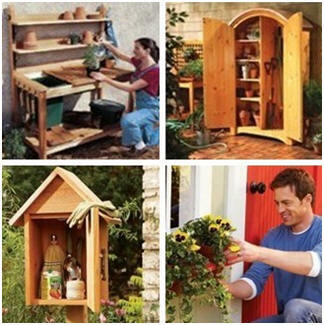 This beautiful outdoor closet is perfect for your garden tools and supplies. You can build it yourself with the help of a free, downloadable plan set. Build attractive wooden planters for your porch, deck or patio with the help of this free plan sets. Build any of eight different beautiful and unusual sheds in your backyard with these free downloadable plans and illustrated step-by-step instructions. 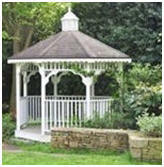 Backyard Project Plans, Kits, Prefabs and Building Help Build something great in your backyard with these deck, gazebo, greenhouse, playhouse and backyard project plans, building kits, manufactured buildings, guide books and building resources. Find Great Landscape Designers, Builders and Landscapers in Your Neighborhood Better Homes and Gardens’ HomeAdvisor.com will give you fast, free quotes on all of your backyard projects from top rated contractors right in your neighborhood. 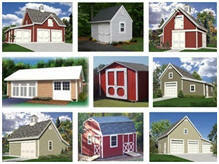 Print Any and All of 100+ Instant Download Building Plans Right Now: Garages; Barns; Sheds; Workshops Get started on your new shed, cabana, barn, garage, car barn, hobby shop, carriage house, workshop or backyard studio right now. With one order for just $29.00 you can download professional construction blueprints for over one hundred different designs. You'll be able to download all of the plans right away and print as many copies as you need to get permits, to get contractors' bids or for use on your own building project. And, the set comes with a complete, 60 day, money-back guarantee. Just click on the underlined links above to see illustrations and photos, floor plans and satisfied customers' testimonials.